Travel on the roads in the nineteenth century was not free - every so often you would come to a toll gate and have to pay a fee to go through. There was a toll gate in Sutton, in Lichfield Road next to the junction with Tamworth Road. The toll house, a few yards in front of what is now Sutton Court, jutted out into the road. The fees were paid to the Turnpike Trust, which had a duty to maintain the roads in good order. The turnpike was established by Act of Parliament in 1807, modified by another Act in 1826 as the Birmingham to Watford Gap Turnpike Trust, responsible for Lichfield Road from Gosta Green to Watford Gap, Tamworth Road as far as Bassetts Pole, and Kingsbury Road. Clauses in the Acts set out what fees were payable, showing what vehicles might be expected on the roads. In 1807 the list was Coach, Sociable, Berlin, Landau, Chariot, Vis-a-vis, Chaise, Calash, Chaise Marine, Caravan, Hearse and Litter; the 1826 clause left out the vis-a-vis, the chaises and the caravan, but added Curricle, Gig, Chair and Whiskey. Fees depended on the number of horses - a six-horse coach was charged two shillings in 1807, but in 1826 the charge was sixpence per horse. Droves of cattle were charged at tenpence a score in 1807, doubled to twenty pence in 1826, of sheep fivepence and then tenpence a score. This is a real price increase, as there was no inflation between the two dates. 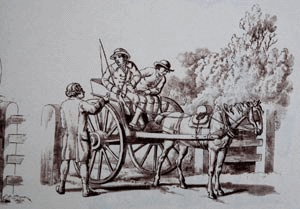 Another additional item in 1826 was “Timber-carriage or dray more than nine feet between axle-trees laden otherwise than with a single piece of timber or stone, one shilling extra”. These were the long heavy goods vehicles of the day, becoming more common as more and more new buildings were going up. There were a number of exemptions, some administrative - mailcoaches, soldiers on official duty, and electors going to the polling station to vote - and some local. The Rector going on his rounds was exempt, local farmers moving their stock short distances, Suttonians carrying loads of peat from Sutton Park, and local people making short journeys of less than two miles. Loads of coal from the Cannock Chase mines were exempt so long as they were for the use of Sutton Coldfield people -there must have been some arguments when doubtful characters claimed exemption. In 1807 there were extensive commons in Sutton, and the Act gave powers to fence the roads where they crossed the commons; if you tried to by-pass the toll gate by cutting across nearby fields you could be fined £5.